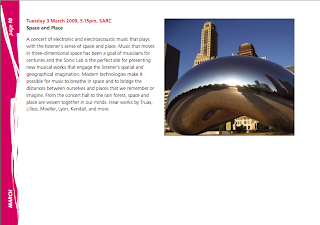 Queen's School of Music presents Space and Place, a concert of electronic and electroacoustic music, next Tuesday 3rd March at the Sonic Arts Research Centre. "Music that moves in three-dimensional space has been a goal of musicians for centuries and the Sonic Lab is the perfect site for presenting new musical works that engage the listener’s spatial and geographical imagination. Modern technologies make it possible for music to breathe in space and to bridge the distances between ourselves and places that we remember or imagine." Works by Truax, Lillios, Moeller, Lyon, Kendall and more. Admission free. Later in March, the Belfast Flickr group will meet at the newly-reopened Ulster Hall as part of Trans Belfast's Free Fringe festival. 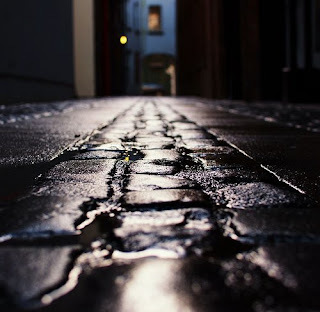 The Belfast Flickr group has to date uploaded well over 15,000 items - browsing through these photos is a really great way to get a feel for the atmosphere of the place, past and present. CABE - Commission for Architecture and the Built Environment (UK) is testing their new website and asking for any comments. Isn't it a pity that NI doesn't have the equivalent of CABE? 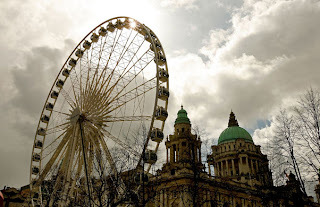 Stuart Jeffries in the Guardian investigates the current worldwide fashion for installing ferris wheels in "status-conscious" cities. The Irish Department of the Environment, Heritage and Local Government and the Irish Georgian Society present the Energy Efficiency in Historic Buildings conference, to be held in Dublin Castle on the 10th March 2009. This one day conference will examine the technical and practical issues of improving the energy efficiency of historic buildings. The conference will address current research on the contribution of existing buildings to sustainability, the assessment of the energy performance of traditionally built buildings and explore the options that exist for making a building more energy efficient while avoiding damage to its fabric or to its character. The keynote speaker will be Dr Nigel Blades of The National Trust for England, Wales and Northern Ireland. 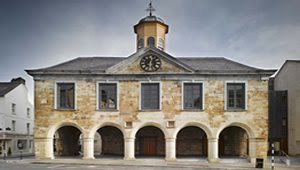 This conference will be of interest not only to conservation architects, engineers, planners and building energy assessors but also to owners of historic buildings, in particular owners of Protected Structures and buildings located within Architectural Conservation Areas, who wish to reduce their energy emissions and costs. The fee for attendance at the conference is €95 (including full lunch). For more info and to book a place, contact the Irish Georgian Society. We had a really nice launch night for Girli Concrete's FABRICATION at PLACE last night. Thanks to all who attended. If you missed the launch, we have special late opening hours for the next Late Night Art (Thursday 5th March), and the exhibition runs at PLACE until Saturday 14th March! Photos by Ruth and Amberlea. 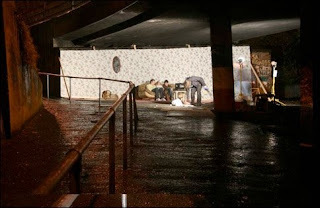 Seeking to "instigate action against bad lighting", the Guerrilla Lighting team is coming to the streets of Belfast on the evening of Thurs 19th March 2009. 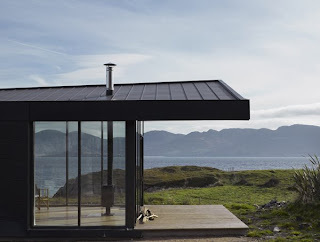 MIMOA is a really excellent resource for modern architecture around the world, taking advantage of some of the best web 2.0 functionality including Google Maps, user-generated content and customisation, and multimedia in the form of photos and video. The idea is to pinpoint examples of great modern architecture around the world, explaining the history of the buildings and letting the user build up their own guide for sites to visit, which is downloadable as a PDF. Here at PLACE, we're also planning to make use of Google Maps in the near future - more on those projects soon. Meanwhile, you can read a bit more about MIMOA here (that blog also has loads more examples of Google Maps in action), and you might note that Northern Ireland is pretty poorly documented on MIMOA at present, with just the Falls Leisure Centre in Belfast included so far, so if you know of more examples of modern architecture the rest of the world should know about, get going! 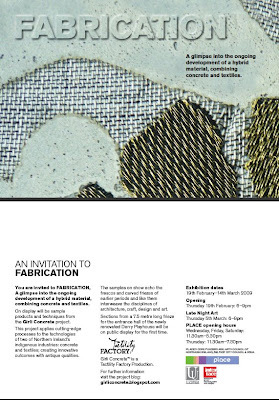 PLACE is hosting an exhibition of recent work from Tactility Factory - opening 19th Feb - 14th March 2009. As well as the work exhibited by UU in its your space or mine? project (on display at PLACE until Sat Feb 14th), more research on contested space is currently being conducted in QUB's Contested Cities, Urban Universities (CU2) project. Tags: CU2, QUB, UU, your space or mine? A big thank you to everyone who braved the blistering cold for Thursday night's launch of your space or mine? here at PLACE. your space or mine? runs at PLACE until Saturday 14th February 2009. All welcome. Tags: Launch, UU, your space or mine? 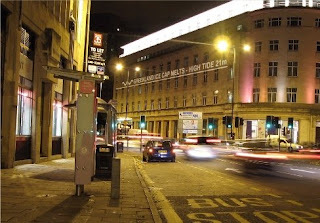 Do current urban renewal and development models offer hope of shared and integrated futures for interface communities? What role can interface communities have in determining their future development? What role do architects have in any of this? Funded by the European Union Peace 2.1 programme, through the Northern Ireland Community Relations Council, this exhibition has its roots in a request by an interface community group to place community interest first in proposals for a key river-front site close to the Brandywell/Fountain interface in Derry/Londonderry. 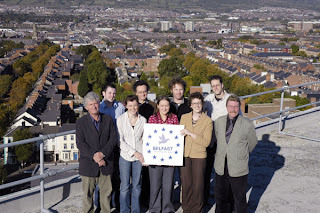 The resulting project involved Derry City Council, DSD, statutory and private development agents and included poetry sessions, art workshops, guerrilla gardening and temporary urban transformations in determining community ambition. While proposing creative ways to discover and release lockedin social, cultural and financial capital in contested spaces, project recommendations also direct these valuable resources towards sustainable and shared futures for interface communities. Opening: 6.00pm-7.00pm on Thursday 5th Feburary 2009, in association with Late Night Art. 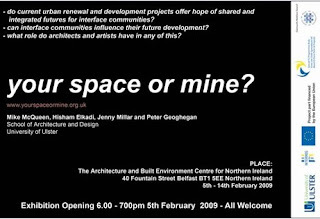 Tags: Exhibition, UU, your space or mine?